Editor’s note: The photo above shows a remnant of the reed beds that used to cover Nanhui and much of the Shanghai Peninsula. The photo is from Iron Track (31.003613, 121.907883), part of a reed bed 450,000 square meters in size lining the Dazhi River near Binhai. As the birding areas at Nanhui fall to the backhoe, future birders searching for species will turn to hidden corners such as this one. Though its position between the Yangtze River and Hangzhou Bay makes it among the richest birding areas on the coast of China, the southeastern tip of Pudong enjoys virtually no protection. The continued transformation of Cape Nanhui is likely, with the reed beds at particular risk. As the backhoes advance, birders ask: Where will we go to find our birds? 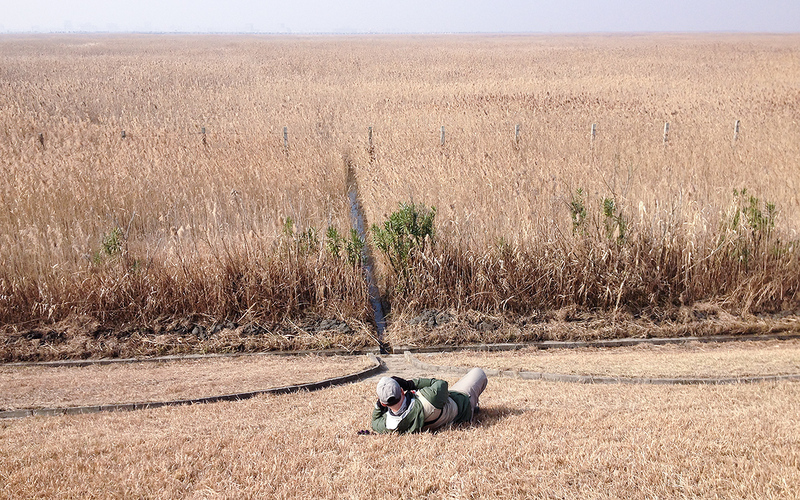 Craig Brelsford searches for Brown-cheeked Rail in one of the extensive reed beds east of Dishui Lake. All may seem well here, but the reeds to the south of the photo have been destroyed, and to the north is the defunct nature reserve. It is highly possible that here too the reed bed will be dredged and plowed under and that in the end only fragments of the original habitat will remain. That would be a pity, because the reed beds at Cape Nanhui are some of the largest and best-preserved on the central Chinese coast. Photo taken 16 Jan. 2016 by Elaine Du. 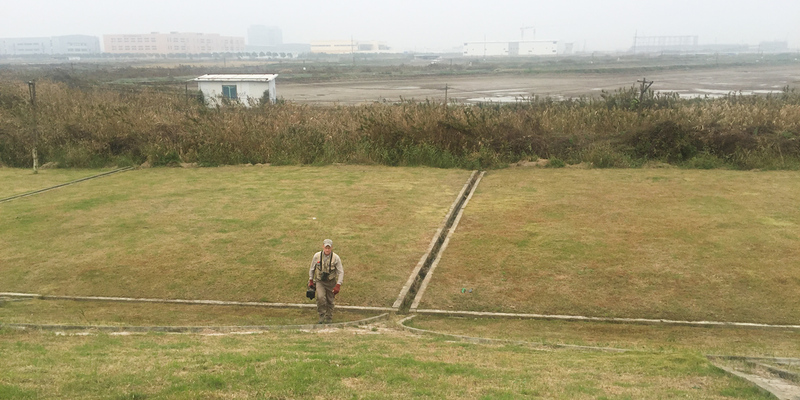 Like archeologists examining a ruin, future birders at Cape Nanhui will scour the fragments of a once-great coastal wetland and try to imagine how the place once looked. Most of the land will have been transformed. Even now, in some of the agricultural areas around Binhai (31.007757, 121.885624) and Luchao (30.857299, 121.850590), nearly all of the original reed-bed habitat has disappeared. If those future birders look hard, though, they will find intact pieces, islands of untouched habitat. Even around Binhai and Luchao, there are such places. Reed beds line man-made canals and larger waterways such as the Dazhi River, the mouth of which holds about 450,000 square meters of good reed-bed habitat. In these fragments, wild birds flourish, much as they always have done, though on a smaller scale. Craig Brelsford walks up the inner base of the sea wall near Luchao, 19 Nov. 2016. 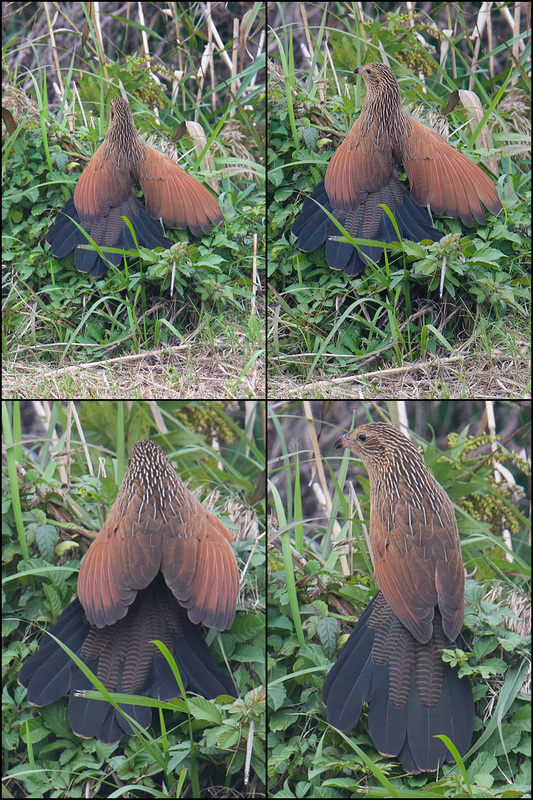 In the midground is a narrow line of reeds in which a Lesser Coucal was foraging. The coordinates of this point are 30.849433, 121.881834. 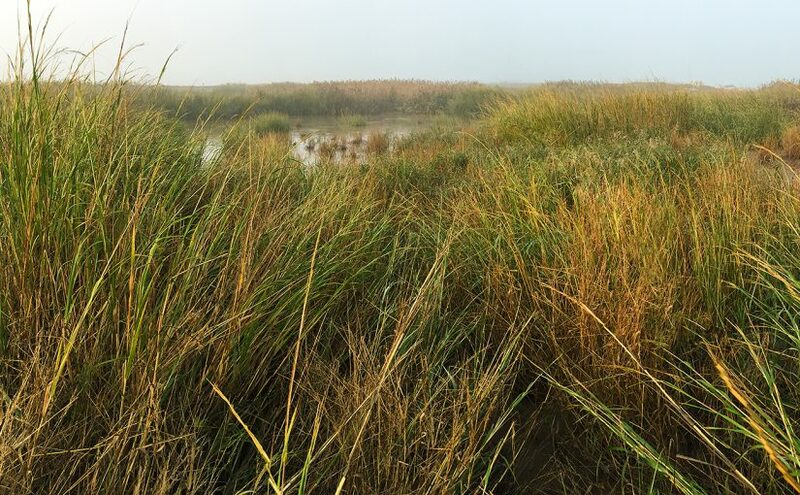 Half a kilometer south, a more extensive reed bed measures 75 m by 2500 m. Photo by Elaine Du. The reed beds east of Dishui are impenetrable–a wilderness within the city. We know that they are rich in birds, and we know that they hold species at risk, among them breeding Marsh Grassbird Locustella pryeri, listed as Near Threatened by IUCN. Judging by their frequency of occurrence at the edges of the reed beds, where they are regularly seen and heard, Near Threatened Reed Parrotbill must number in the high hundreds at Nanhui. Just this past Saturday, our team found Near Threatened Japanese Reed Bunting. Lesser Coucal in remnant reed bed near Eiffel Tower (30.849433, 121.881834). The coucal was very much at home and may have been born there. 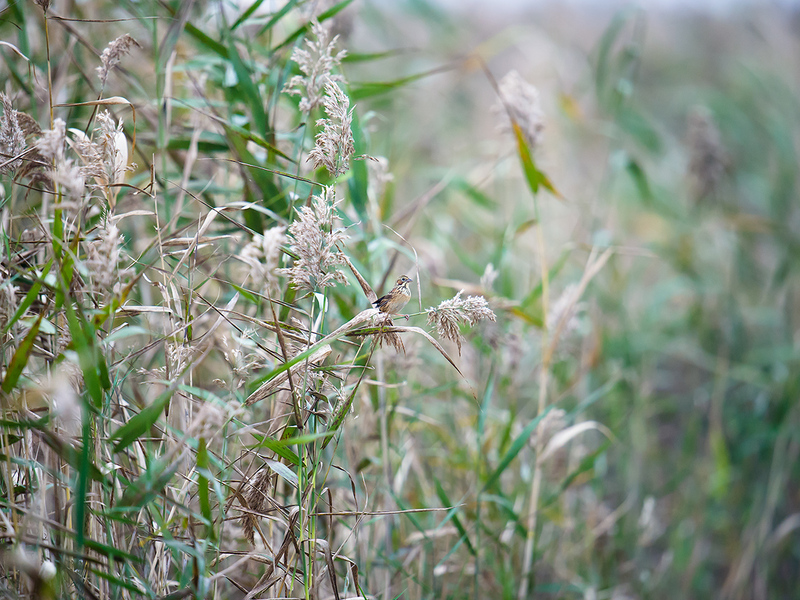 The reed beds in the Luchao area have been reduced to less than 1 percent of their historical extension. Those specks of habitat support a scaled-down community of the birds once common in Shanghai. Even the tiny fragments near the towns hold a surprisingly high number of species. At a site (30.850707, 121.863662) north of Luchao, in reeds lining a canal at the base of the sea wall, Yellow-breasted Bunting have been present throughout November. On Saturday we found this Endangered species for the sixth time in six tries since our first sighting there on 5 Nov.
Chestnut-eared Bunting in a world of reeds at the site (30.850707, 121.863662) north of Luchao currently reliable for Yellow-breasted Bunting. The site is part of a reed bed measuring 75 m by 2500 m–188,000 square meters of precious reed-bed habitat. Decades ago, such a modest parcel of land would have seemed a drop in the bucket. Today, remnants such as this provide habitat critically important to dozens of species once common in the area, among them the two aforementioned species of bunting as well as Brown Crake, Lesser Coucal, and Reed Parrotbill. The site, part of a reedy area 75 m wide and 2500 m long, also yielded a small flock of Reed Parrotbill as well as wintering Chestnut-eared Bunting and Pallas’s Reed Bunting. Just north of the site, near Eiffel Tower (30.850531, 121.878047), there is an even smaller fragment of reed bed. There, we had juvenile Lesser Coucal. Reed beds are an extremely rich habitat, and even a tiny area can hold many birds. Even if disaster continues to befall the large reed beds that still exist near Dishui Lake, not quite everything will have been lost. Birding will go on–in the remnants. On Sat. 19 Nov. 2016, Michael Grunwell, Elaine Du, and I birded Cape Nanhui. We found 78 species. We had Japanese Reed Bunting on the north side of the defunct wetland reserve (30.926452, 121.958517), the Hooded Crane that apparently spent a week in Nanhui, a single Baikal Teal (and presumably others shrouded in haze), a juvenile Lesser Coucal very much at home in remnant reed bed near Luchao, and Yellow-breasted Bunting at its reliable spot (30.850707, 121.863662). Non-passerines: Tundra Swan (bewickii) 6 on the mudflats, Black-faced Spoonbill 6 in the defunct wetland reserve, Eurasian Spoonbill 45, Black-faced/Eurasian Spoonbill 30 in haze with bills tucked in, Black-tailed Godwit 1, Red Knot 2, Temminck’s Stint 1, Red-necked Stint 7, Dunlin 850. Passerines: Brown-flanked Bush Warbler 1, Naumann’s Thrush 1, Chestnut-eared Bunting 15, Taiga/Red-breasted Flycatcher 1 (seen in poor light by Elaine; presumably the same confirmed Red-breasted Flycatcher found by Kai Pflug). I published this map last week, but I think it is worth examining it again. 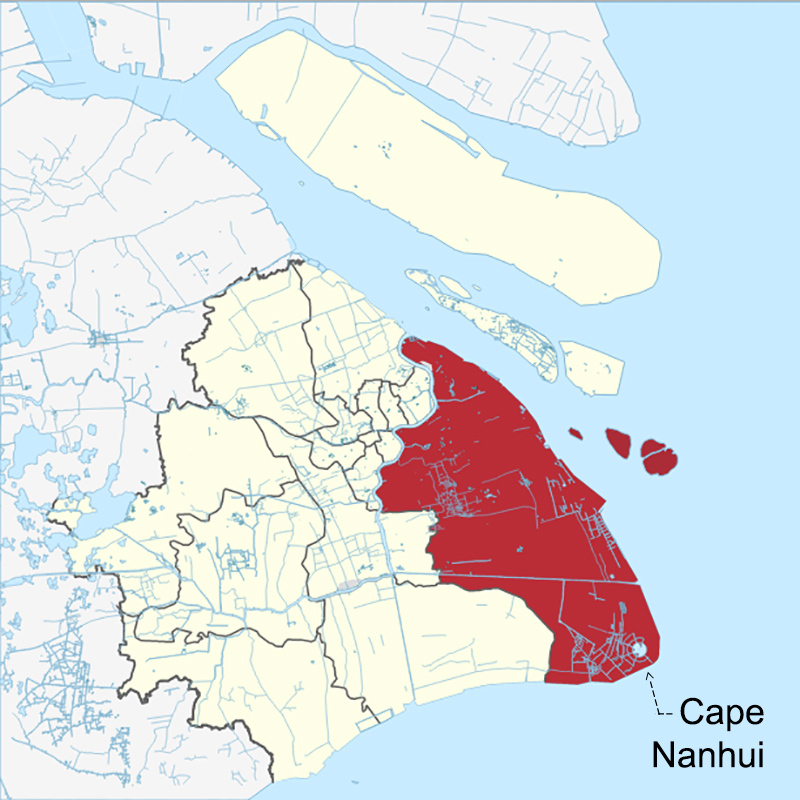 ‘Cape Nanhui’ is an important birding area not just because it is coastal but also because it is a headland–the southeastern-most point of Pudong (red) and the entire city-province of Shanghai (yellow areas plus Pudong). Migrating birds hugging the coastline are drawn to areas that jut out. Just a few hundred meters inland, however, the intensity fades. The bird mix at places such as Binhai Forest Park (30.966324, 121.910289), just 4.5 km inland, closely resembles that of the urban parks farther inland. Map courtesy Wikipedia. On Saturday our team made its first trip since 31 Oct. 2015 to Binhai Forest Park (30.966324, 121.910289). The site yielded a late Mugimaki Flycatcher. More importantly, the brief visit gave us insights into the nature of migratory birds. Though just 4.5 km inland, Binhai offers a mix of birds more akin to that of Century Park (22 km inland) than the coastal areas much nearer-by. Passerines moving through our region clearly hug the shoreline, especially around headlands such as Cape Nanhui. Some of the smaller Nanhui microforests, such as Microforest 2 (30.926013, 121.970705), are about the size of a tennis court. But as they are a stone’s throw from the sea, they hold a much greater density of passage migrants than Binhai, which is 1600 times larger (1.5 sq. km) than Microforest 2. Japanese Reed Bunting Emberiza yessoensis, defunct nature reserve (30.926452, 121.958517), Nanhui, 19 Nov. 2016. Owing to the loss of wetland habitat in its breeding range (which in China includes Heilongjiang) as well as in its wintering grounds, IUCN lists the species as Near Threatened. Michael, Elaine, and I were on the unpaved track on the north side of the defunct Nanhui reserve (30.926452, 121.958517). We were studying the roosting shorebirds and spoonbills. I got a call from Wāng Yàjīng (汪亚菁), who along with her husband Chén Qí (陈骐) found Swinhoe’s Rail at Nanhui last month. 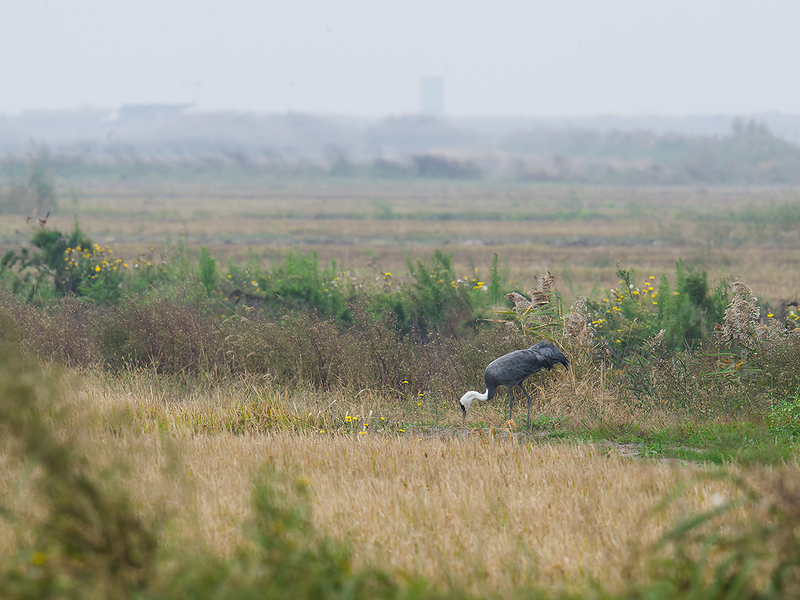 She told me a Hooded Crane was in the rice paddies 1.5 km north of us. As we were rushing back to the car, I noted a lone reed bunting in the thick vegetation lining the dirt track. A lone reed bunting struck me as odd; Pallas’s Reed Bunting are common in the area and usually in flocks. I pulled out my camera and got a few images, which I did not have time to check. We got in the car and drove to see the crane. 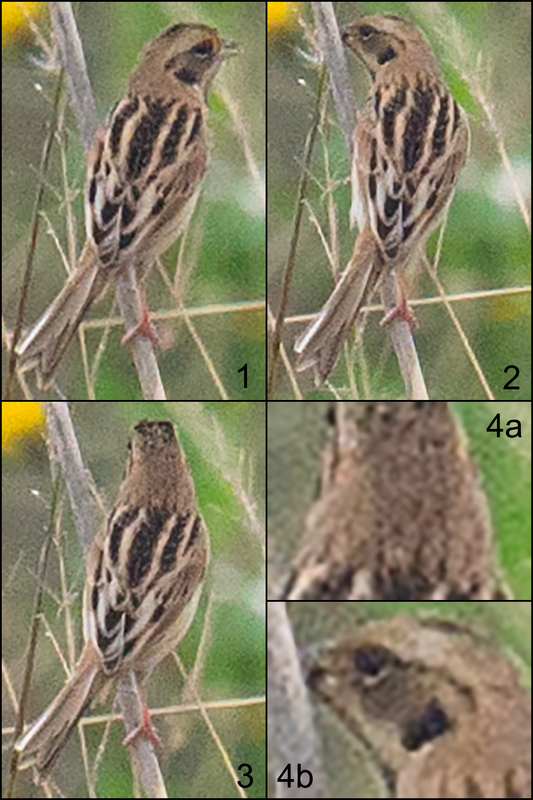 Only the next day, when I sat down to look at Saturday’s photographic results, did I realize that I had photographed Japanese Reed Bunting Emberiza yessoensis.